This entry was posted in Reclaiming Place and tagged adulthood, beach, childhood, family, memories, Outer Banks, summer, tradition, travel. Bookmark the permalink. I love stories that are from childhood and the beach. Gosh that was a lovely walk down a lane I often take only ours was Ocean City, New Jersey. Thanks so much. My dream as a 12 year old was to live at the beach and work on the boardwalk and never grow up. . . I completely relate, Doreen! I even got to live in Ocean City, NJ and work on the boardwalk the summer I was 20. Best summer of my life! Now that is cool! We always ate pizza and they tossed it right there in front of you and I thought, hey I’d love to work here! I’m glad you had that best summer Amy. Write about it! ! Amy- That’s beautiful. And I love the picture of your family at the beach. I’ve never seen John (the younger one) looking quite so dashing. 🙂 You have a wonderful family. I miss your folks and I’m thankful for the times that I got to see them and all the Maczuzaks that I’ve gotten to meet over the years. You guys are a great bunch. I can see your mom saying that & it cracked me up because I’m with her on that (except I like to swim in the ocean with the kids, but that’s it). Thank you for sharing your memories. This is beautiful. 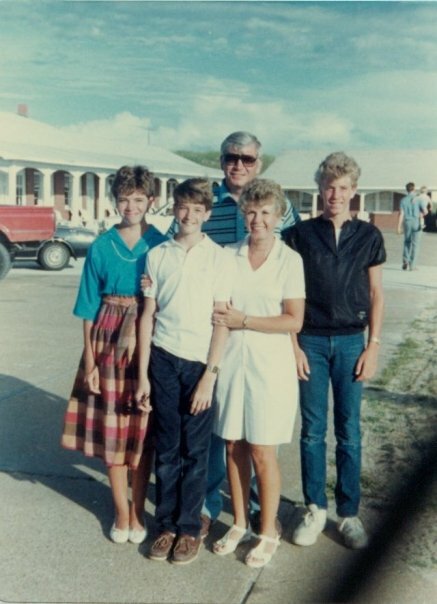 We’ve never been the “extended family vacation” family – and that’s something I’ve always longed for. Thanks for sharing a bit of your story with us – even with the sad parts about places that stop being “yours” in the way they once were. Thank you, Nicole. It was therapeutic to write this piece. This is a touching piece, Amy. I didn’t understand how deep my own sense of loss has been until I read this. I hope you will always remember Uncle Mike welcoming your Dad with a red-hot bloody mary (or vice versa if your family arrived first), flounder left-overs from our Cochina Beach cook-outs, laughing about the cookware that never changed year to year, and the fellowship and the laughs that we shared each time we gathered. I’m sure his friends believe John is exaggerating about our deep-sea fishing trip. I could go on, as you well know. The loss of your Mom and Dad make these memories that much more precious. Thanks for the reminder. Thank you, Uncle Paul. So many wonderful memories and so little space! 🙂 The Cochina Beach cookouts (and the flies), the all-you-can-eat Friday night meals at The Wharf (when it was still there), the go-carts, going with Aunt Barb, Kathy, and Kathy to see “Grease” when I was 11-going-on-12 and still too young and innocent to get most of the innuendo, shopping at the outlets on rainy days, the paper bathmats… I’m so glad the tradition lives on. Time marches on, I guess. I know that I speak for all the Maczuzaks that still make the trip, your parents, you, your siblings, and their families are missed every year still. This brought a tear to my eye, because I know what this week still means to me (and my kid, who has now pledged to never miss it again). P.S. I’m pretty sure Mom would have abandoned the Cavalier years ago too if left to her own devices. Happy to hear that a return is not out of the question! There are probably non-beach sitting things that we could organize a rotating slate of cousins to do with you… I mean, we don’t know what they are, but I’m sure they exist. Amy, you really captured a sense of loss here that is universal, even though your story is so wonderfully specific. This summer my husband and daughters and I are spending a week at a Lake Michigan cottage we rented several summers in a row but haven’t been back to in four years. Now our girls are all teenagers, and while the nostalgia of the place is appealing, I’m also aware that our experience will be very different. Somehow I need to prepare myself to hold that sense of loss with an openness to what is new. Thank you, Kristin. I feel like this piece has become a metaphor for me of the experience of growing up and growing older. The Outer Banks experience is one of many I could explore. You are a great writer, Amy. I love to read them. How beautiful, Amy! Your attention to detail and the way in which you put your heart on paper touched me deeply. Thank you. Thank YOU, Lisa. It’s a bittersweet story, and it helped me to tell it. -I love the Outer Banks, so I could picture exactly where this was. -With both my folks gone, too, I know some of what you touch on. The things that brought joy may do so again, but often their quiet absence can be the only thing your heart hears. So even when in a happy place, the grief you think is yours alone in that place clouds your experience of the joy others are experiencing. -You can’t go home again, and it stinks. You always thought you could, even if it would be different. But sometimes, it is just to stark. -Even so, and here is where I’d encourage you to return, smile and go back. Make new memories. They won’t be the same, but maybe some day they’ll be telling the stories of the time that Aunt Amy or crazy cousin Amy did ______. You can’t make the memories like that from a distance. -And when you do return, give me a heads up. ‘Cause that’s never too far from my neck of the woods, and I’d love to come hang out for a few moments. Maybe I can show you some of that off-sand stuff that only the Outer Banks can offer!